Nail Tips & Tricks: Ways to Be Creative - Hwatien Enterprise CO.,LTD. Doing nails can be a fun, artsy thing to d. Plus, there are many different styles and patterns that you can create. Since I’ve been doing my own nails for years now, I can agree that it is very doable to create some neat nail art at home! Nails can be as creative as you want them to be, from 3D nail art, to rhinestones and diamonds, polka dots, and even stripes. Some people actually do glow in the dark nails! With nails, I prefer to wear a color that matches my mood or vibe, just because there are so many choices to choose from. Nail art can be seen as a way of expression, even down to the shape of the nail. To be able to get the best kind of nail shape, a nail filer would be your best bet. I say this because with a nail filer you’re more in control and it’s less likely that you will make mistakes. You can make make your nails as sharp, square, or oval as you want. With a nail clipper, you can accidentally cut them down too short or too crooked and the final result is an even shorter nail. Unless you have a good eye, using a nail filer would be a considered a safer choice. Tip: When polish is feeling really thick and gunky, use a drop of polish remover to get its texture back. 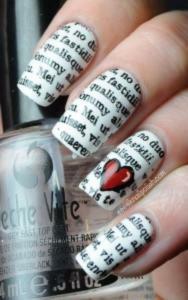 A cool trick to do at home on your nails would be Newspaper nails. This nail art materials consist of newspaper, alcohol pads, and a light base coat of your choosing. For starters, what you would do is, start with polishing your nails with the base coat, I preferably say light, such as white, or a soft pink, so that you are able to see the letters from the newspaper onto your nails. Once those are dry, you would cut up a newspaper article (a section with words) then cut them up into squares, big enough so that they cover your entire nail. When you are finish cutting the squares, you turn the newspaper frontward onto your nails so that the words are placed onto them. Next you would use an alcohol pad and place it on the back of the newspaper on the nail while applying a little pressure. Make sure the alcohol comes in contact with the entire newspaper onto the nail. After a minute, you slowly peel off the newspaper and there you have newspaper nails. Remember to apply clear coat when dried! Tip: If your nail ever appear to be cracked or slightly damaged, buffing them would be a great way of repairing the nail surface! 3D nail art is three-dimensional artwork created on the fingernails. 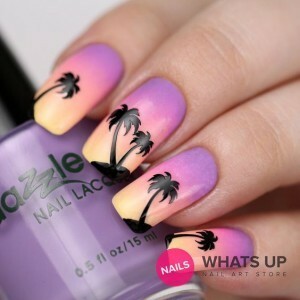 Typically, the design is created on acrylic, or fake, nails, which are then applied over your natural fingernails. To create the designs, add colored acrylic to a mold using a paintbrush and wait for it to harden. Once the material is ready, remove it from the mold and and glue it to the fake fingernails. Non-acrylic options include gemstones and other materials small enough to glue onto the nails. Flowers are one of the most common 3D nail art creations, and the petals and leaves stick up from the surface of the nail for a dramatic look. 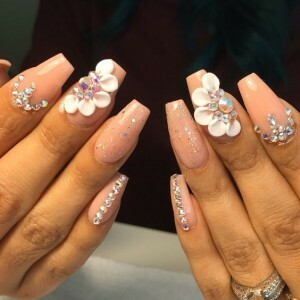 Many people choose to wear nail art simply because it looks different and attractive, although many use it for special formal occasions, like a wedding. Tip: Nail art requires extra caution and care to avoid breaking the 3D creations off. While the pieces can be applied to real nails, they are often better suited to acrylics because the nails are stronger and longer, providing more room for the piece. There are many types of nail stickers available in the market nowadays! They are quite pocket friendly and easy to apply on your nails. You can get gorgeous nails in less time by using pre-designed stickers. Also they are godsend for those nail art lovers who can’t create the free hand designs! Each type of sticker has a different method of application. You can easily apply these stickers on both hands yourself with zero error. However, sometimes it may become very difficult to do nail art on your hand with the non dominant hand. One of my favorite stickers to use are the full nail art stickers, these are the stickers that cover the entire nail. I prefer these because the designs are always unique, and it gives it a more complete look. Tip: Always apply a slight amount of oil on nails before polishing; it makes it easier to remove excess polish around your finger. Polka Dot nails are simply cute and can be easily applied. Just like the newspaper nails you will first need a base coat. This time it can be of any color choice, it doesn’t has to be anything specifically light or dark. Another cool thing about doing polka dotted nails is that the utensils come in all shapes and sizes of dots, which means more designs and patterns that you can create! For those who don’t have utensils, you can use things around the house such as toothpicks, q tips, pencils or a permanent tip marker; any of these should be able to give you the dot size that you would like to create for your nail design. For example, to use a toothpick you would break out the pointy edge of the toothpick so that you will have a thicker and rounded edge. Dab a small amount of polish onto a clean sheet of paper and slowly but surely poke the toothpick into the polish and slowly coat your base polish with small polka dots. Q tips, cotton tips and pencils also follow the same procedure and they can be easier to use for some who would want bigger or wider polka dot sizes. Nail art pens and permanent tip markers are specially designed to create perfect looking polka dots and can be easier if you want to experiment more. 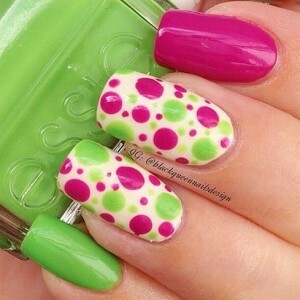 You can also overlap polka dots with each other to achieve a wonderful effect! Of course don’t forget to apply your top polish to preserve the polka dots which you have creatively dabbed on your nails.